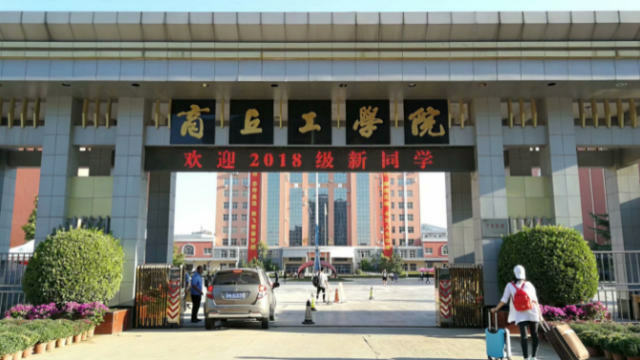 Some universities in Henan Province have included the assessment of anti-religion knowledge as part of the graduation requirements and are intensifying the promotion of atheism to the newly-enrolled students. In September, the Department of Education in the central province of Henan issued a document demanding to intensify anti-religious activities at universities. The higher education institutions were instructed to use online media and social platforms to promote Marxist views on religion, the ideas of atheism and science as well as, through propaganda efforts, raise awareness of students about the national policies on religion. The document also calls for the strengthening of students’ ability to resist religious beliefs. 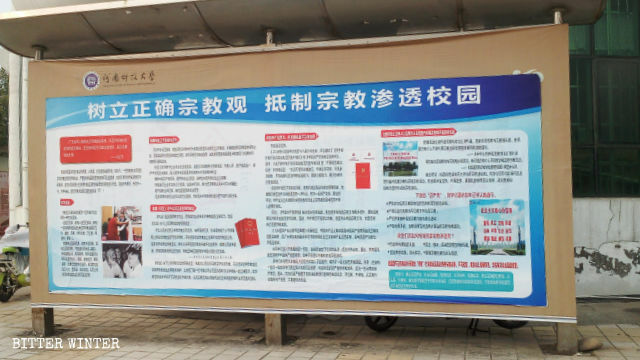 An anti-religion propaganda poster at the Henan University of Science and Technology. As part of this anti-religion effort, the Department of Education has created an online platform Anti-Xie Jiao Instructive Education Knowledge Challenge for University Students to test their understanding of resistance to religious beliefs. This is the second such test prepared by the Department; the first was launched in 2017. 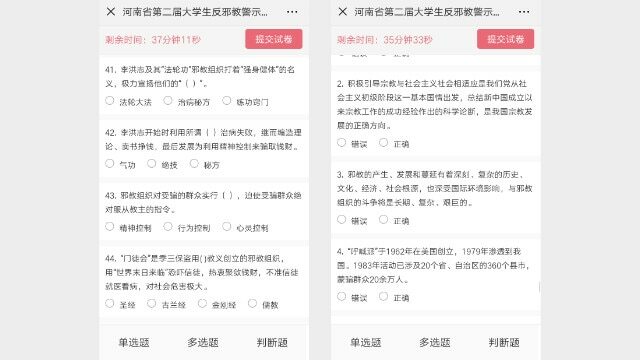 The questions in the test emphasize the harm of religions and are intended to make all university students stay away from any religious groups and movements, especially those that the Chinese Communist Party has listed as xie jiao organizations (heterodox teachings). The online platform Anti-Xie Jiao Instructive Education Knowledge Challenge for University Students. The leaders of xie jiao organizations use the lie that “Believing will allow someone entry into heaven, and not believing will lead to hell” to ( ) people. Xie jiao organization Falun Gong is characterized by ( ). Leaders of xie jiao organizations always claim that they are God or Buddha in order to ( ) themselves. Some questions from the anti-religious knowledge test for students in Henan’s universities. All new students were given an anti-religion publication and were demanded to read it until they could recite it from memory; otherwise, they will have their course credits deducted. Without the required amount of credits, students would not receive a diploma at graduation time. As per the student, from September to October, the university convened a number of meetings for students who were threatened to be expelled if anyone was found out having religious beliefs. The student also revealed that without their permission, the teacher in charge of the school’s dormitory looked through students’ belongings in their rooms to check whether students are reading religious books. 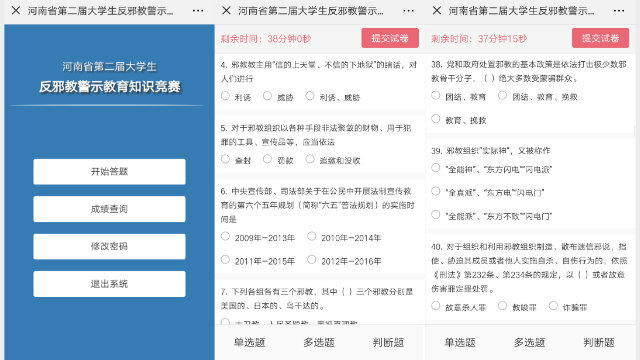 According to sources, at a university in Henan’s Jiyuan city, each student was ordered to take the anti-religion knowledge test on their cellphones. Those who failed the test had one credit point deducted, and the students who did not take the test at all – four points.